My children are little “fruity foodies”. Provide them a fruit platter and they will devour it in a few minutes. I don’t know how, but somehow I raised kids that would rather eat fruits over other desserts any day. 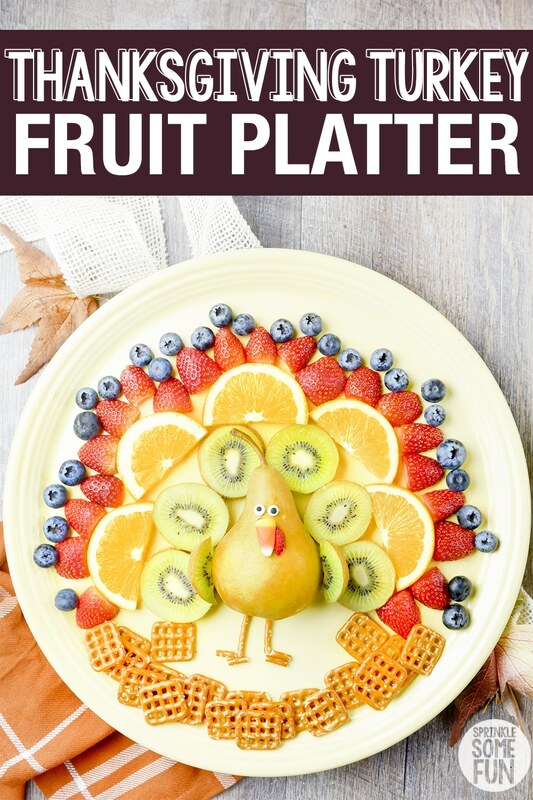 This Turkey Fruit Platter is an Easy Thanksgiving Fruit Tray that will please any fruit lover at a Thanksgiving gathering. You don’t need to wait until Thanksgiving day to make it either! It’s great to make with kids for an after school snack or just because. They will love helping to make the cute turkey with you too. Although, making this platter was a challenge to do around my little “fruities” because they kept sneaking in a piece of fruit here and there. haha That’s okay. I just made sure to have plenty of fruit for snacking on as well. We also like to eat on this fun and festive fruit platter on Thanksgiving in the afternoon before Thanksgiving dinner while we are making the rest of the food. It’s a light snack to have that won’t ruin our appetites. Serve it up with a little fruit dip for any ever sweeter treat! The best part is that it’s super easy to make. All that is needed is to slice the fruits and add some decorations to the pear to make it into a turkey! It’s so simple that even my three year old was able to help out with it! Pretzel sticks for the legs and for the bottom of the tray. The legs are made by using a pretzel stick for the leg and a cut pretzel stick for the feet. I also used Pretzel Snaps (affiliate) for my tray because I loved how they looked! This link to Amazon has a big canister of them, but there are so many uses for pretzels for the holidays: think snack mix, platters or even make candies with them. Well worth it to get a big tub of them. A large serving tray that is at least 19 inches wide is best for this turkey fruit platter. The fruits will take up a lot of room and so you want a really big plate or tray. I love this Fiestaware Pizza Tray/ Serving Platter (affiliate). The one I used for the pictures is also yellow like the one I linked to, but the one I used is a retired color. 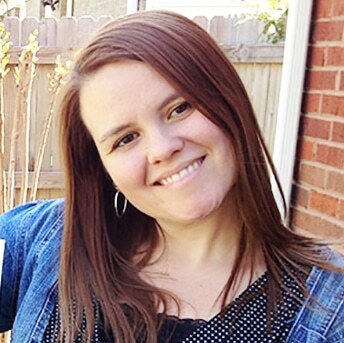 For the turkey’s face you’ll need a piece of Candy Corn (affiliate). I always end up having a little candy corn leftover from Halloween, but if you don’t the link above should have some. Sometimes they still have some available at supermarkets, but don’t count on it. Your best bet is online or a candy store. You’ll need either white melting chocolate or icing to stick it to the pear. The turkey’s eyes are made with Mini Candy Eyeballs (affiliate). Put a little icing or white melting chocolate (affiliate) on the backside and stick it to the pear. I used a Bartlett pear for the body. The pear is cut in half so that it will stay on the tray and not move around. You can also use other varieties of pears, but make sure that they have the typical pear shape and that the stem is still on. Also, think of the color you want the turkey to be. Green, red, yellow/ green or even a brown colored pear would all look great for a turkey! The turkey “snood” is made with a little sliver of a strawberry. It most likely will stay on top of the pear without any icing or white chocolate. You can add some to yours if you want. 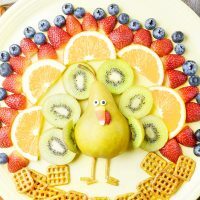 The fruits I used for the turkey feathers are: sliced kiwi (you can either leave the skins on or take them off), sliced and halved oranges, small sliced strawberries, and blueberries. 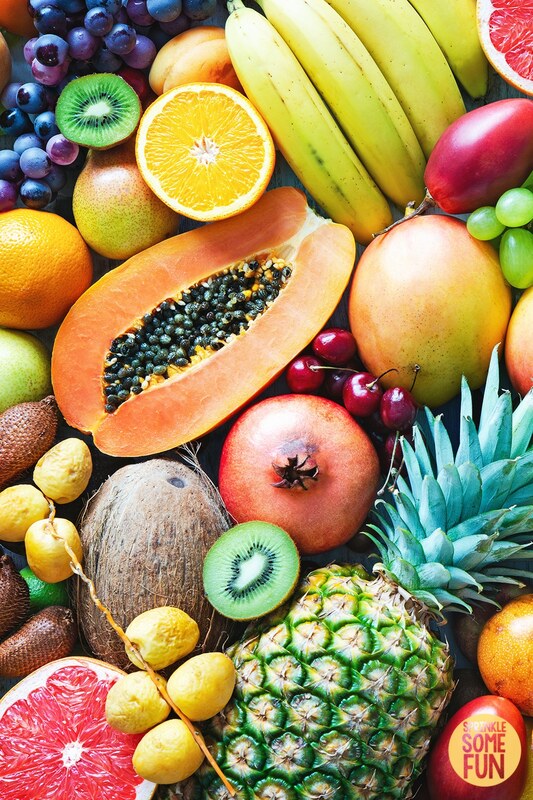 Most fruits should work just fine for the platter, but I would suggest using fruits that don’t brown too easily or at least add an acidic coating like lemon juice to fruits like bananas, pears and apples. 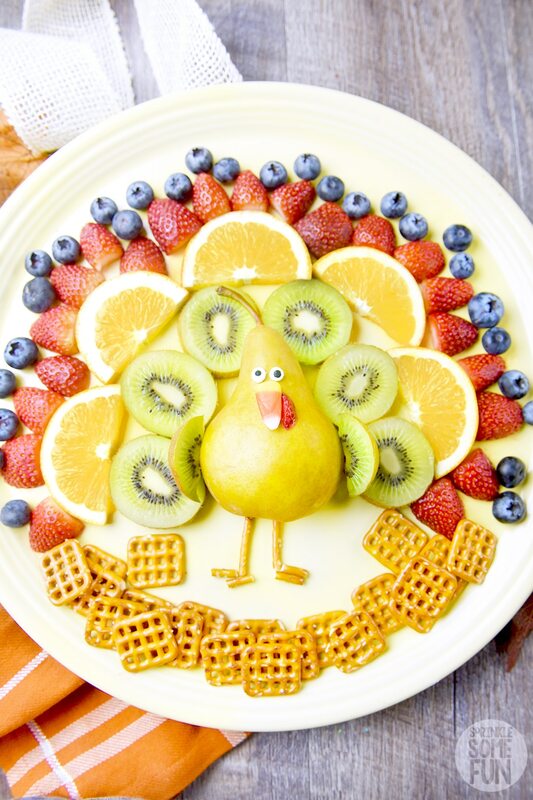 If you have a particularly large crowd I would suggest making two or even three Turkey Fruit Platters! I think a set of platters would look great together and you could use different fruits for each one. The only fruit that I think needs to stay the same is the pear, but you could change up the color of the pear for each platter if you want to. Do you love making fruit or veggie platters for the holidays? A few years ago I made a scarecrow veggie platter that is so good and also super cute! It would be fun to pair the two of these together for some fresh offerings at the Thanksgiving table. 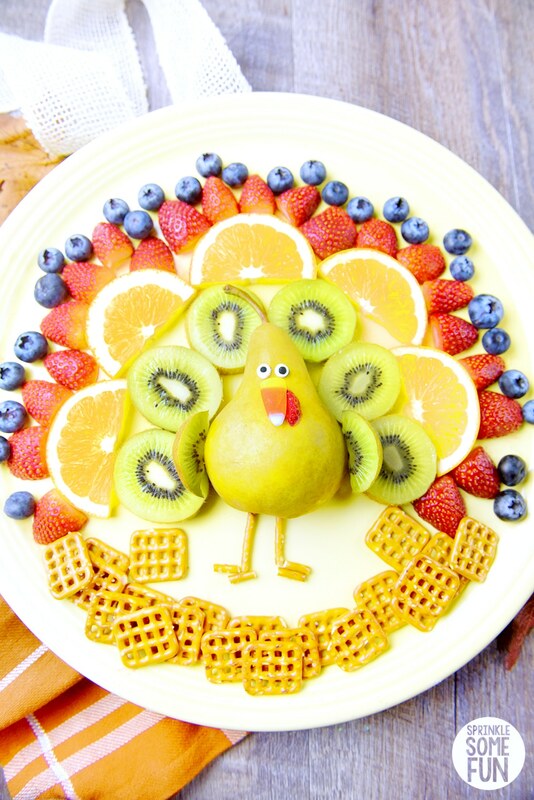 This Turkey Fruit Platter is an Easy Thanksgiving Fruit Tray that is both simple and adorable! If you LOVE this Nail Kit Ornament Gift Idea, be sure to share it on Instagram and tag me #sprinklesomefun so I can see it! 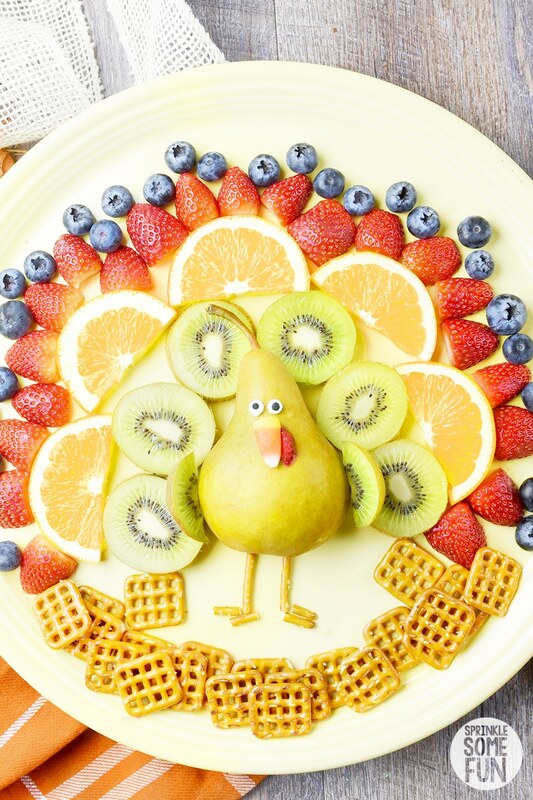 A Turkey Fruit Platter is both simple and adorable! Follow this step by step recipe to make your own Easy Thanksgiving Fruit Tray. To assemble your platter: Place the pear in the middle of the tray towards the bottom. You'll need more room on the top for all the fruits. Start by adding the fruits to the tray around the pear in a semi circle. The best way to do this is to add the larger fruits first like the oranges and kiwi. Then add the smaller fruits towards the top like the strawberries and blueberries. Next add the eyes (mini candy eyes), beak (candy corn) and snood (small strawberry sliver) with either icing on the back or a small amount of melted white chocolate. Now you can also place the kiwi wedges you cut up for the turkey wings on the platter on the sides next to the pear. Lastly, add the pretzel stick legs as shown in the picture. To prevent them from rolling all around the tray you can add a little icing or melting chocolate on the underside. The feet are just broken pieces of the pretzels. Add more pretzels to the bottom of the tray to complete the turkey fruit platter. I used pretzel snaps, but any pretzels you have will work too. 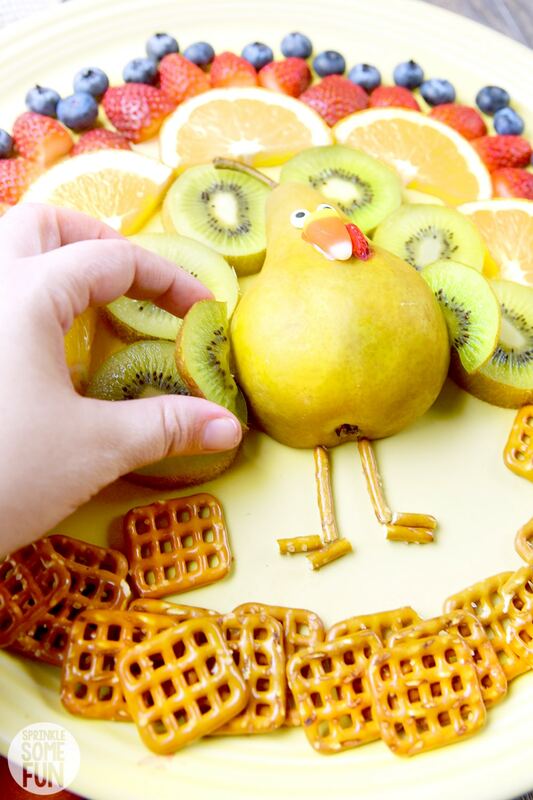 Enjoy your tasty and cute turkey fruit platter! see notes in the post for even more tips and suggestions!